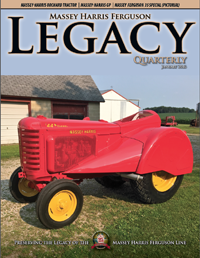 Welcome to Legacy Quarterly, the magazine that four times a year will bring you fifty plus pages of high quality color photos and great stories. 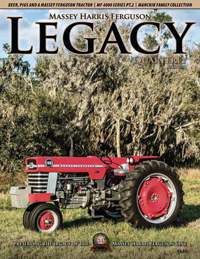 This publication fulfills a lifetime dream of showcasing the Massey Harris Ferguson brand. I hope you enjoy it as much as my small staff enjoys bringing it to you. 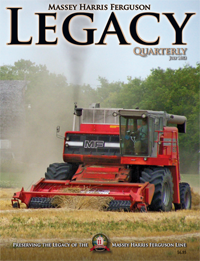 Issue #3 was mailed on June 30 and is the combine special issue. 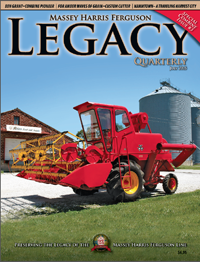 It features the history of grain harvesting and how it related to the Massey Harris Company as well as the high quality color photography that you have come to expect. 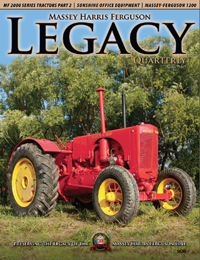 There is a special section on Australian harvesters, experimental Wallis and Ferguson combines and many other great stories. This is an issue that you won’t want to miss! July marks the release of the first in a series of DVD’s. See the ad and printable order form listed under WHAT’S NEW right here on the website. 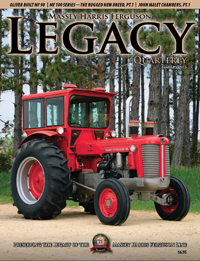 Issue #2 was released at the end of March and features the Massey Ferguson 1100 Series tractors. There are a few copies of collectable Issue #1 still available. They may be ordered for $10, which includes mailing. New subscribers who order before the end of April will have Issue #2 mailed to them at no extra cost. 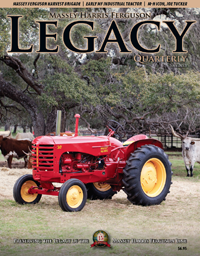 Welcome to Legacy Quarterly , the magazine that four times a year will bring you 68 pages of high quality color photos and great stories. 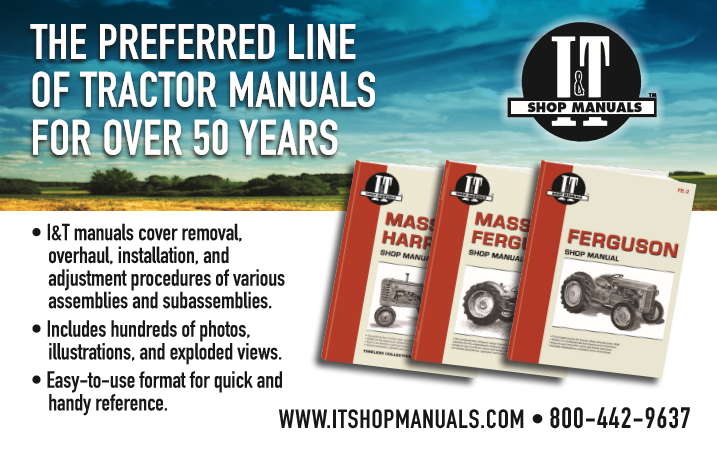 This publication fulfills a lifetime dream of showcasing the Massey Harris Ferguson brand. I hope you enjoy it as much as my small staff enjoys bringing it to you. 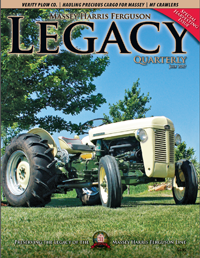 Quite a few readers commented that there were no outtakes posted for LQ #37. I had hip-replacement surgery the first week of January which went well but two weeks later had some complications which knocked me out of commission for the rest of January and a good part of February. Things are getting back to normal now so I will post the outtakes for both issue together. The April issue is in the mail the first week of April so by the time this is posted, most subscribers should have received their copy. We received some really positive comments about the special feature on the Massey-Harris Triples, which included the Models 333, 444 and 555. 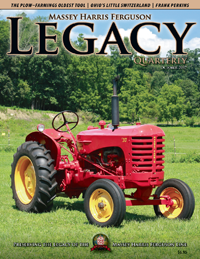 It was entitled “The Last Massey-Harris Tractors.” It was actually in four sections. 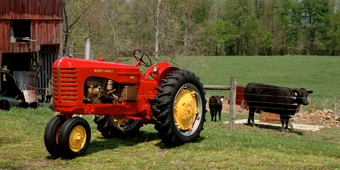 The first featured collector Dennis Brown’s restoration of a M-H 444 Standard LPG tractor. This was followed by a look back at the Tub Drohman estate sale in which the Models 333 and 444, serial #1 tractors were sold. Part three introduced collector Tim Gronenthal who is the new owner of this rare serial #1 tractors. Readers got a good look at the tractors and the rest of Tim’s collection. The excellent photos were taken by Tim’s son-in-law, Robert Kennedy. Lastly, the feature concluded with a history of the formation of Massey-Harris and Harry Ferguson into the Massey-Harris-Ferguson Company. 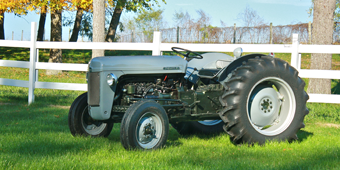 The Triple Series were the last new models introduced by Massey-Harris before the final transformation to the new Massey Ferguson Company in 1958. 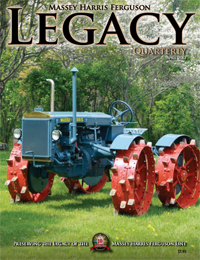 The last part of issue #37 was a pictorial about the joys of plowing, entitled, “Plowing, a Day Well Spent.” I followed a plow day hosted by the Lloyd Fraase family and the photos were taken by Lloyd’s son, John Fraase. The introductory essay was written by Missouri resident and collector, Dale Lawrence. 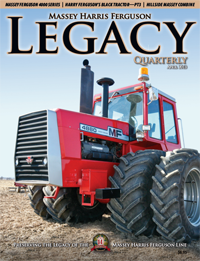 The feature in this issue is a two-part series on Massey Industrial Tractors. 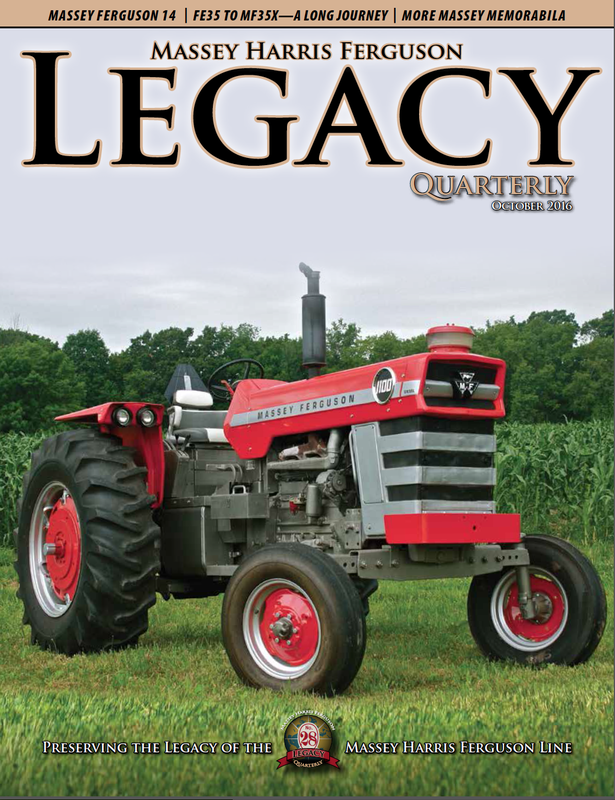 Part I, in LQ #38 is Massey-Harris, Ferguson and Massey Ferguson Industrial Tractors. It follows the development of the early Wallis style M-H tractors that were manufactured for industrial applications and continuing through the many different variations of Massey-Harris General Purpose tractors. I think that readers will be greatly surprised at the many different variations that were produced by the Massey Company in Racine, Wisconsin. This was followed by the M-H 303 and 404 Work Bull Series and the Davis built Pit Bull. Part one concludes with the M-H-F 202 which was widely used in a variety of applications. The “Illustrated History of Making Hay,” is a pictorial history of man’s quest to harvest grass forage in a less labor-intensive manner. It contains old magazine photos, advertising images and calendar graphics that I have been collecting for many years. I hope that you find it both informative and a pleasure to look at. 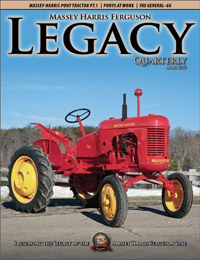 The Making Hay feature is followed by an article about the Massey Ferguson #48 Hay Packer. It was an attempt to produce a machine that in one step, produce a solid hay cube–or wafer¬–that could be stored and feed like ear corn. It was a good idea but was a commercial failure. This issue also contains five “Extended Letters”. Four of these were carried over from previous issues because we just ran out of space. They are all excellent examples of shared family history. I think that you will find them very enjoyable reading. 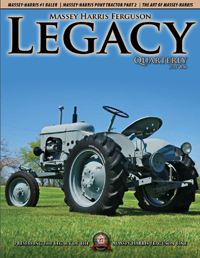 The last article is about the Massey Ferguson 24 lawn mower. It carried the MF name but was produced by the Dura Corporation in Zanesville, Ohio. This is the same company that built the Detroit Harvester Brand of farm equipment. They were the producer of the #41 Highway Mower that was designed for the Massey-Harris Pacer and Pony tractors. These little riding lawn mowers were also sold as the Moto-Mower Lawn Chief, painted orange, the Mark V, sold by Porter Cable and the Little Chief, sold by Montgomery Ward. We still have a few 2019 calendars left which Sue has discounted. If you didn’t get a calendar this year, don’t wait too much longer. 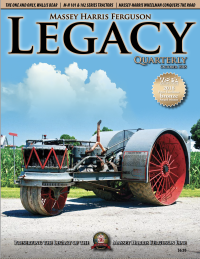 The updated back issue DVD, now has all of the out of print issues, so if you are missing a couple of Legacy Quarterly installments, you can order this new DVD. We still have copies of the movie, “The Great Ohio Harvest”, which we produced two summers ago. It a great film that included some early combines history as well as documenting the great wheat harvesting event held in Northwestern Ohio. 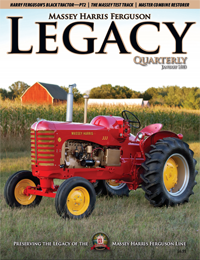 Be sure to check out the show ads in LQ #38. 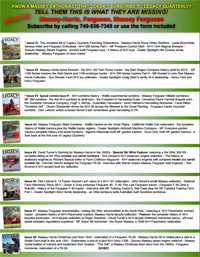 These are some of the most important shows that feature the Massey and Ferguson families of tractors and equipment. Sue and I hope to see you at one of these shows this summer! 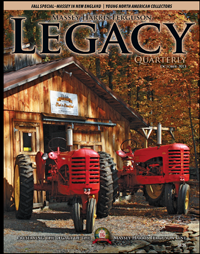 The October issue was in the mail the first week of October and most subscribers had their copy by the second week of the month. There is an ongoing mail strike in Canada so many Canadian subscribers took longer than usual to receive their copy. The feature article was on the Wallis tractor company and their sole remaining Fuel Save Model, more commonly known as the Wallis Bear. It is owned by Fred Schmidt and the Schmidt Machine Company of Upper Sandusky, Ohio. I have been eager to do an article on this tractor but found that it took several years to locate all of the information needed to get an in-depth story put together. I think that readers will particularly enjoy the never before published images that included in the article. I will include a few that we were not able to fit into that article. 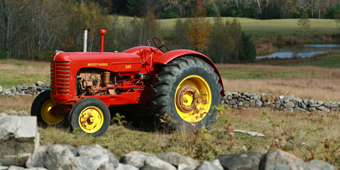 The second feature is on the Massey-Harris 101 and 102 Series tractors. 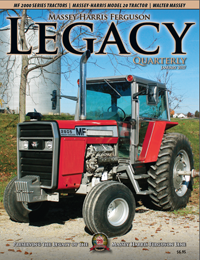 Included is the story of collector Daren Meyers and the restoration of his M-H 102 Distillate tractor. Daren is a very knowledgeable collector and was instrumental in helping me put this feature together. 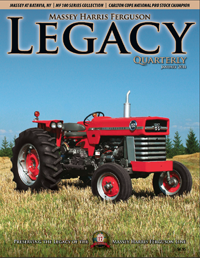 The article includes a history of the Massey-Harris Company’s quest to market a tractor, marketing tractors made by other companies. Other articles include a story about bicycle enthusiast David Brown who rides his antique Massey-Harris bicycle all over North America. The article includes some great photos and a brief history of the Massey-Harris dominance of the bicycle industry in the late 1800’s. The annual Christmas greeting from the past is a very unique image from December of 1920 from the Wallis Tractor Company of Cleveland, Ohio. It includes a special Christmas greeting from company president, Henry M. Wallis. 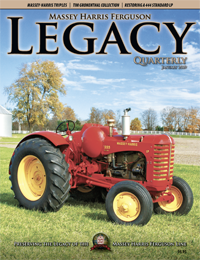 This October issue also includes the ever-popular Working Tractors segment. 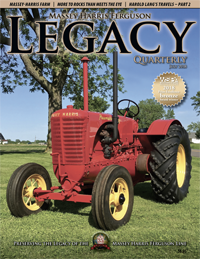 It includes thirty images from twelve states and two Canadian Providences that prove that old Massey and Ferguson tractor can still earn their keep. Everything from plowing, hauling manure, making hay, seeding oats, mowing orchards, mowing waterways and of course, entertaining the grandchildren. Even though it called "Working Tractors", I included a couple of images of Working Horses as they were pulling Massey-Harris implements! Last but not least, there is a Christmas story about young women who give birth to her first child on Christmas Eve. The story is set in south-eastern Ohio where the young couple can’t get to the hospital due to an unusual early winter flood. The hero is a young veterinarian who along with is new Massey Ferguson 35, saves the day. The story is illustrated by Ontario artist Johnny Filipchuk. 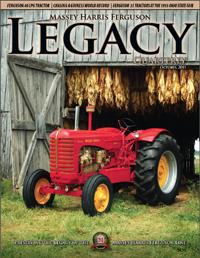 Of course, there are eight pages of letters and photos from Legacy Quarterly readers. Don’t forget the Massey-Harris "Triples" (Models 333, 444, 555) will be featured in the January issue. 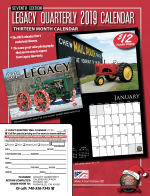 Don’t forget that the Legacy Quarterly 2019 calendars are now on sale. We will start shipping orders the first week of November. They make a great Christmas gift. Another great gift idea is the film, "The Great Ohio Harvest" which available on DVD. You can purchase a higher definition version as a download. Call and ask for details. If you like combines, you will love this film which we produced through Locust Grove Productions. As usual, keep your letters coming. Email is preferred, however, if you choose to mail (USPS) your letters and photos, please type if possible and label each photo with your full name and phone number on the back of each print. If you like old Massey combines, you will want your own personal copy of the new film that we produced last fall. It shows a group of old Massey combines, harvesting one-hundred acres of wheat last summer at Sauder Village in Ohio. The film includes a series of photos, showing vintage Massey-Harris combines working on the Great Plaines in the 1930’s and 1940’s. See the ad on the homepage of this website. We will start the Outtakes with photos of the Massey-Harris Company Farm. 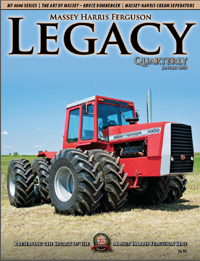 I'm still working with our website guy, Joe Warehime, to get some newly procured videos up and running at legacyquarterly.com There is one on the Massey Ferguson 2000 Series tractors that takes you through the design and manufacturing process. It is very detailed and runs about 24 minutes. It is the only copy I have ever seen. Another film on the 2000 Series is already posted and it called the Tough 2000 Series . 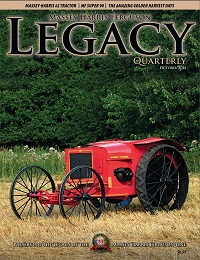 If you like MF history and are a fan of this model tractor, you’ll find this both informative and enjoyable! Another is an old Ski Whiz film from the late 1960’s. You can guess the production date without even looking at the title. 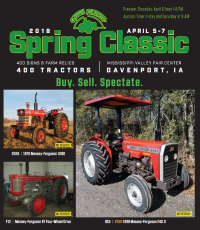 If you are interested in early Massey Ferguson advertising, be sure to listen to the series of radio commercials that are posted on the homepage of the magazine website. It is great comedy and traces the early history of the company. Announcements about postings will be made on the magazine facebook page. 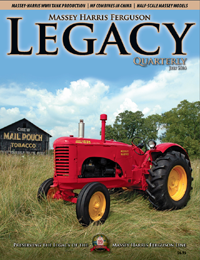 LQ #31, the July 2017 issue was mailed the first week of July and was delivered to most subscribers by July 12th. 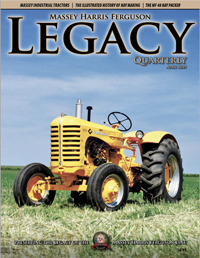 This was a special issue that featured several stories about harvesting. 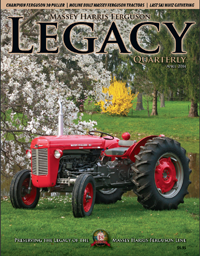 An extended article about the Lloyd Fraase family’s last big harvesting show and their extensive Massey collection, got this issue rolling. Another harvesting story chronicled former Massey Ferguson employee, Frank Vieria’s work on the MF 860 combine. 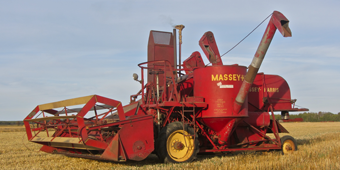 Contributor Gordon Barnett has put together an article about former Massey truck driver Ernie Smith, who hauled Massey-Harris and Massey Ferguson prototype combines around North America for field-testing. 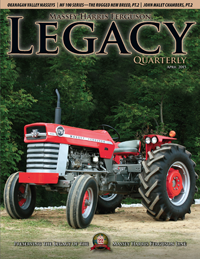 Noted author John Farnworth produced an article about Massey Ferguson track tractors–or crawlers–that were widely used in Europe but not in Canada or the United States. If you are interested in crawler tractors, you will find this very informative reading. 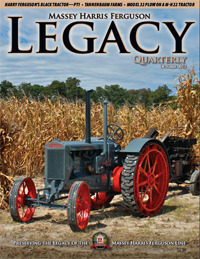 Lastly, the long awaited history of the Verity Plow Company is finally published in this issue. It contains a wealth of historical information and contains many primary sources including the great-great grandson of the company founder. Ontario resident Bill Verity contributed much information to this article from his personal family history. Four Extended Letters round out this issue, which I hope that you will enjoy. Don’t forget that the new calendars for 2018 will be available in October. There will be a small change in this year’s calendar. There will be thirteen ¼ page size ads available for this year’s calendar. The ad will be placed at the bottom of each page. The calendar is very expensive to produce and these additional small ads should help to offset the additional printing costs. The ads will be available on a “first-come” basis. Call or email for additional details on purchasing an ad.